A pair of newlyweds asked their guests to not bring gifts to their wedding. Instead, they all came together to donate $4,000 to A Home 4 Spot Animal Rescue in Las Vegas. 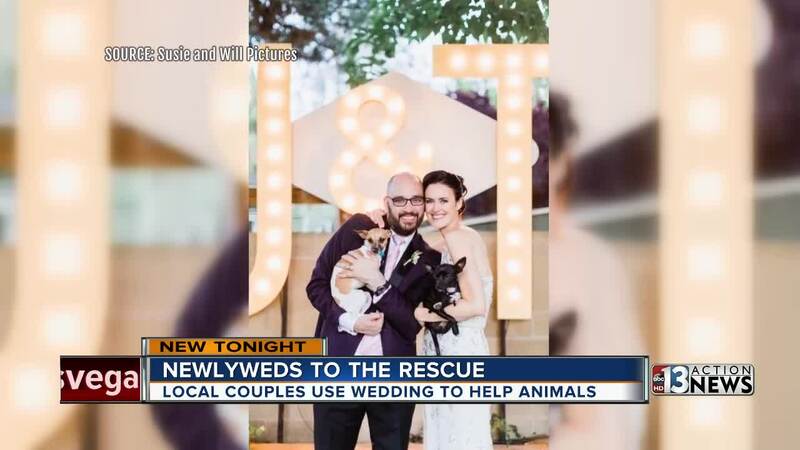 A couple of Las Vegas newlyweds made a selfless move by asking their wedding guests to donate to their favorite animal rescue organization in lieu of wedding gifts. Jessica Rauch and Tony Lopez feel fortunate they were able to make a decision like this. "We're very blessed to have a lot of the things that we would already need in life," said Rauch. They're also both dog lovers. "We both great up with dogs and love animals very much." They decided to put their heads together and figure out how they could give back on their wedding day. "Both of us really like to give back and volunteer for nonprofits and we like to live our lives in a charitable way so we thought hey what better tribute than to encourage our friends and family, if they want to give us a gift, to donate to A Home 4 Spot," said Rauch. The couple recently adopted their two dogs from A Home 4 Spot and loves the way they operate. "We didn't know much about them but they were this amazing group of volunteers foster the puppies in their homes and when we met them, and the volunteers, and then of course they introduced us to Shorty, we fell in love with the whole operation." All the pieces came together and donating to their cause was what the couple wanted to do. "Our friends and family were so generous and really stepped up to the plate." The couple was able to write a check for $4,000 to the animal rescue group. "Everything matters and so any donation that they receive goes to food or leashes or anything they need to keep the operation running." Rauch says the rescue group was ecstatic. "(They were) over the moon thrilled and we couldn't be happier that that was the decision that we made." Also, instead of having their wedding party hold flowers to walk down the aisle, each member carried a shelter dog instead.